WINDSOR, Ont. — Four University of Windsor researchers are sharing in $1.6 million in provincial funding for projects designed to strengthen Ontario’s manufacturing competitiveness and solidify the university’s reputation as a leader in global automotive research. Ming Zheng, who will receive $1.3 million to help develop cleaner and more efficient diesel engines, said the funding is “critical to our research efforts and will allow us to see into the future when cleaner, more efficient diesel engines begin replacing gasoline engines.” Zheng said that one engine block in his lab at the Centre for Automotive Research and Education can cost as much as $1 million “so this funding is very welcome.” Zheng’s research is funded jointly by the university, government agencies and ministries as well as by industrial partners. “This funding will enable our researchers, in particular here at the University of Windsor, to help improve our manufacturing competitiveness in a global market,” said Sandra Pupatello, minister of economic development and trade, who made the announcement on behalf of John Milloy, minister of research and innovation. 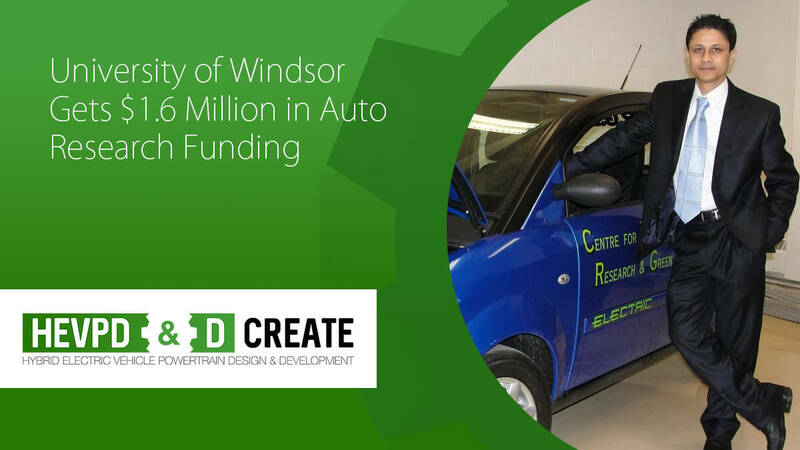 “This centre is conducting automotive research that rivals anything being done anywhere else in the world,” said Pupatello. Narayan Kar is receiving about $180,000 to help create next generation hybrid auto technologies with the goal of reducing the industry’s dependence on fossil fuels. Others receiving funding include Sreekanta Das for research into the lifespan of steel under extreme conditions and Zhuo Wang for research into advanced materials such as polymers. “This is a day which celebrates research and we have an obligation to make the most of the opportunities that government is extending to us with this funding,” said university president Alan Wildeman.